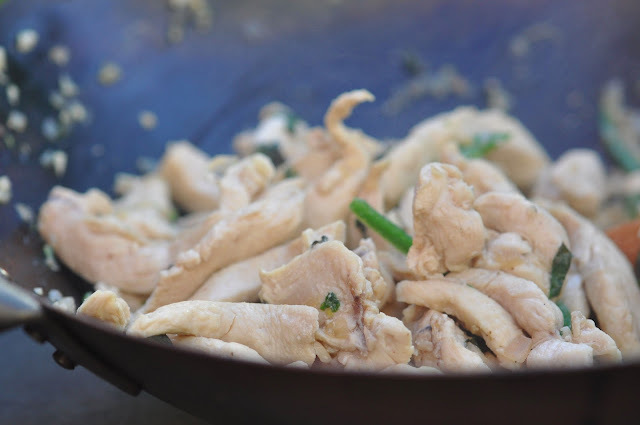 Heat wok or large skillet over medium heat for 2-3 minutes. Add oil, then chopped garlic and shallots. Stir fry the garlic and shallots until aromatic, for a minute or so, then add the chicken. When the chicken is cooked, toss in the chilies and the seasonings (fish sauce, sugar, and sweet soy sauce) and continue to stir-fry. Add in the basil leaves and do a few quick stirs until the basil leaves are wilted and fragrant. Add the pepper, taste for seasoning, and serve. * to cut basil into thin strips, a/k/a chiffonade, stack 5-6 leaves on top of one another, roll into a cylinder and then use a sharp knife to make thin slices thru the cylinder. Repeat until you have about 1/3 cup of basil chiffonade.